In this series, we introduce the nine artists behind Marking the Infinite: Contemporary Women Artists from Aboriginal Australia, on view at The Phillips Collection June 2 – September 9, 2018. Nonggirrnga Marawili was born into the Madarrpa, one of the approximately 20 clans composing the Yolngu people in Arnhem Land, the sparsely populated northeastern tip of the Northern Territory, which consists almost entirely of Aboriginal lands. Marawili learned to paint while assisting her husband Djutadjuta Mununggurr, an artist and leader of another Yolngu clan, the Djapu. 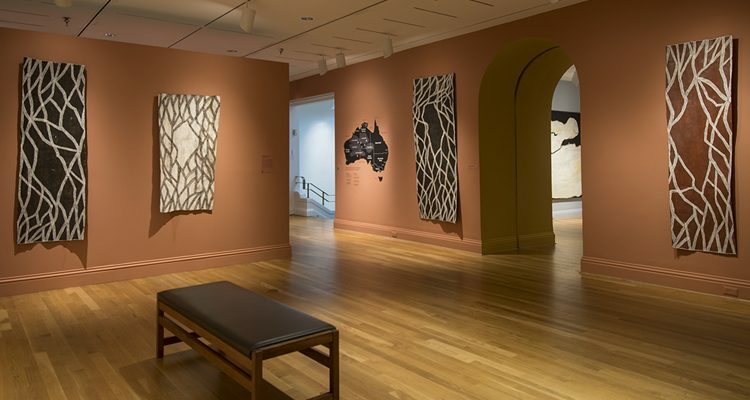 During the 1990s, she contributed many important commissions and exhibitions of Yolngu art, but it was only after 2011 that she emerged as one of the preeminent figures in contemporary bark painting. In 2015, she was awarded the prestigious bark painting prize at the National Aboriginal and Torres Strait Islander Art Awards. Recently, she was selected for inclusion in the 2017 National Indigenous Art Triennial at the National Gallery of Australia, Canberra.